Plot summary: The whole town is troubled by the full moon. Joel is stranded in the wilderness at night and encounters a surprising figure, while Chris finds a surprising connection with a visiting stranger from Portland. 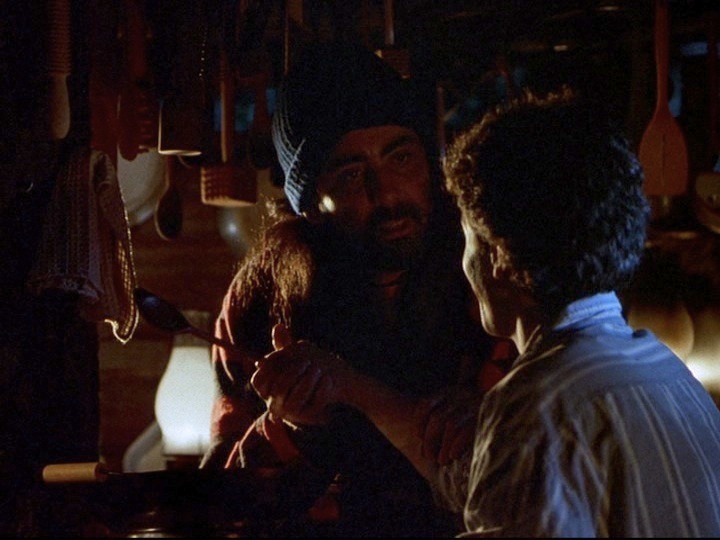 The final episode of Northern Exposure is the snow-capped peak to what surely is a remarkable first season. From the opening strains of “Moon River” and Chris in a dark DJ booth, the episode establishes a languid bed on which we can lay our dreams. There is something strange about the full moon, which shines so brightly that the townspeople cannot get a good night’s sleep; it disturbs people’s psyches and makes them do crazy things (warns Chris, “Put away those sharp utensils. And stay close to your loved ones, if you’re luck enough to have any”). The moon gives off a different kind of light to see by, perhaps illuminating things in life that are mysterious and hidden. 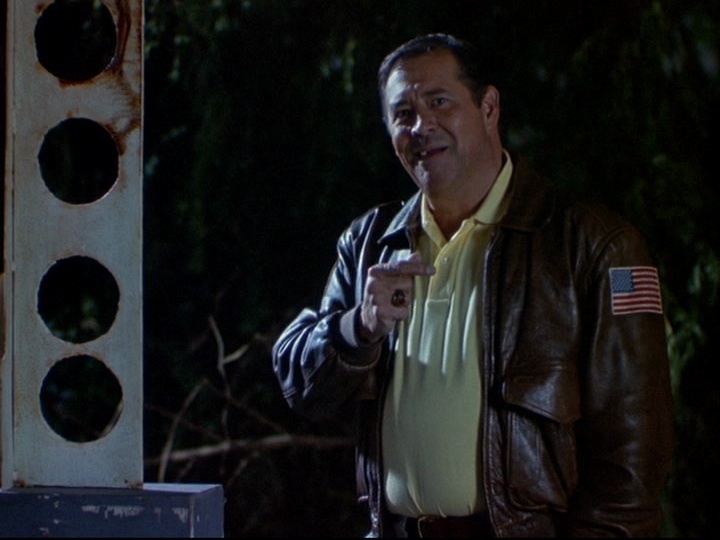 Maggie says, “This moon is like sleeping with a searchlight on,” and the idea of someone searching for something appears throughout the episode. For example, we meet Ranger Burns, whose job is to look for fires; Dave the cook suddenly leaves his job at The Brick in search of the wilderness and sleep; a stranger on a motorcycle comes to town looking for something and ends up in Cicely, Alaska. Even the three songs prominently featured in the episode include the idea of looking for somewhere (“Moon River”: “Two drifters off to see the world / There’s such a lot of world to see”) or someone (“Blue Moon”: “You heard me saying a prayer for / Someone I really could care for”; “Mr. Sandman”: “Mr. Sandman, bring me a dream / Make him the cutest that I’ve ever seen”). Yet one consequence of the full moon that the residents of Cicely don’t anticipate is that characters find things that they aren’t necessarily searching for. Amusingly, Chris finds a good-looking girl named Chelsea while looking for art materials at Baker’s Point. Chris befriends an African-American stranger named Bernard and quickly discovers that Bernard is his half-brother. Whether because of the moon or the Northern Lights, Chris felt compelled to start his Aurora Borealis sculpture five days earlier, while five days before Bernard had a dream which compelled him to quit his job, sell his condo in Portland, buy a Harley, and ride North. Some strange force seems to be at work. Joel, on the other hand, tries his hardest not to find anything. 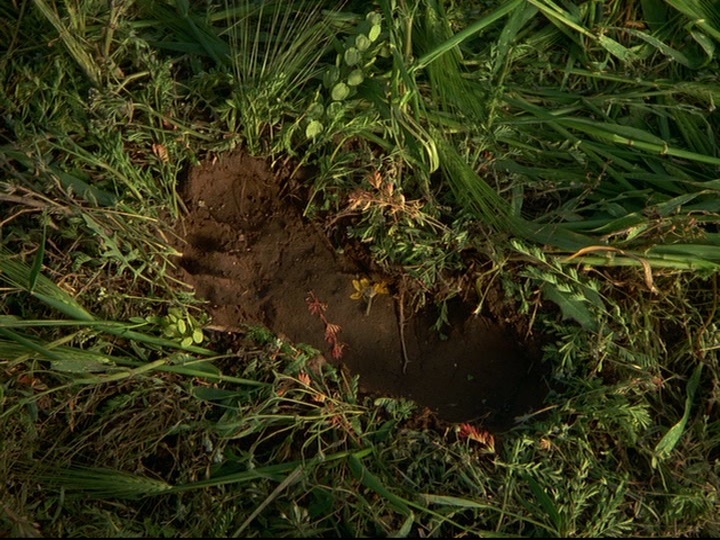 He reacts with fear when he discovers the massive bare footprint and learns of the alarming figure of Adam, who no one has ever seen. He puts deadbolts on his cabin door and asks for bars on the windows. However, all of Joel’s attempts at avoiding Adam lead him to actually come face to face with his fear. The Adam that Joel finds is nothing to be feared at all (Adam: “I’m Adam” / Joel: “Oh, I’m Chef Boy-Ar-Dee”); instead, he finds a figure who is familiar with New York, someone who is intelligent, sarcastic, urbane, and a terrific chef. 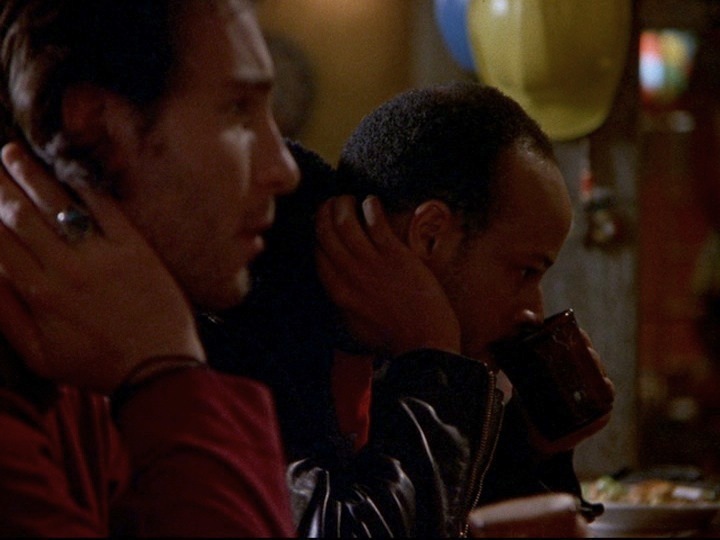 While Chris finds his soul mate in his brother Bernard and they become near doppelgängers of each other (they even start to speak in unison by the middle of the episode), Joel finds himself in front of a mirror. It can be argued that Adam is the extreme version of Joel: hostile, paranoid, anti-social, but also funny, intelligent, and with a dry sense of humour. Both Chris and Joel discover other selves. While Chris is definitely changed by his discovery, it is less clear if Joel will be similarly affected. Even the final scenes of “Aurora Borealis” show people searching. (They need to use a flashlight because the once-searchlight-like moon has waned.) We see Joel dragging Ed and Maggie through the woods to where Adam’s cabin once stood, where the only trace of previous habitation is a single dismantled garlic press. Still, Joel seems happy at the discovery that confirms that his encounter with Adam was not a dream after all. 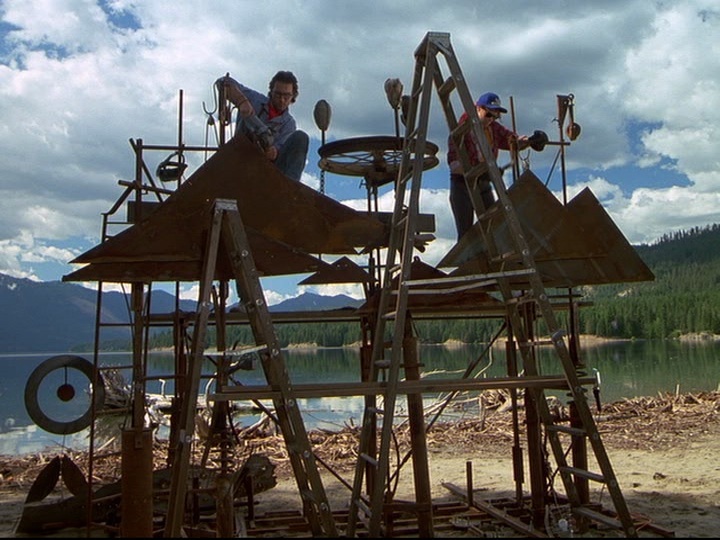 The final scene shows Maurice, who has been puzzling over Chris’ (and Bernard’s) metal sculpture, continuing to search for a meaning in the art. One moment he seems to understand (“I get it,” he says). But like Joel’s encounter with Adam, this too seems to disappear under the Northern Lights. The Good: In an episode riddled with goodness, we are particularly delighted to see the introduction of both Adam and Bernard, two wonderful, distinctive characters. The Notable: This episode resounds with many themes and patterns from previous episodes, including dreams, family, loneliness/aloneness, games, containing multitudes, and bears. On’s Rating: 10 out of 10! Shane’s Rating: 10 out of 10! This may have been discussed in the podcast but do you think that Adam really exists? Good point. That would definitely work as a theory, at least until Adam appears again in “The Bumpy Road to Love” (3.1). He is pretty much an uber-Joel — everything Joel is but to a much larger degree. 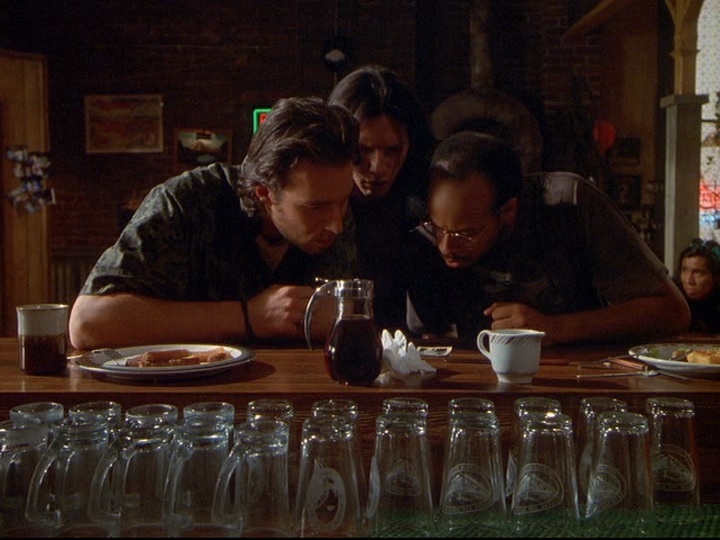 I sat up last night watching this episode again to celebrate the 24th anniversary of the original airing. My imagination is still captured by this episide. The series had some great moments, but this one was special. Did the Aroura Borealis sculpture actually exist as more than a prop? Wow, 24th anniversary of the original airing – we wish we’d realized that and done the same! The episode 1.8 is really special to us too – there is a rare magic in this episode – everything about it is perfect. As to the sculpture, it sure looked great with the northern lights. The NX folk tend to spend a lot of effort on art and props (another example is the trebuchet, of course). 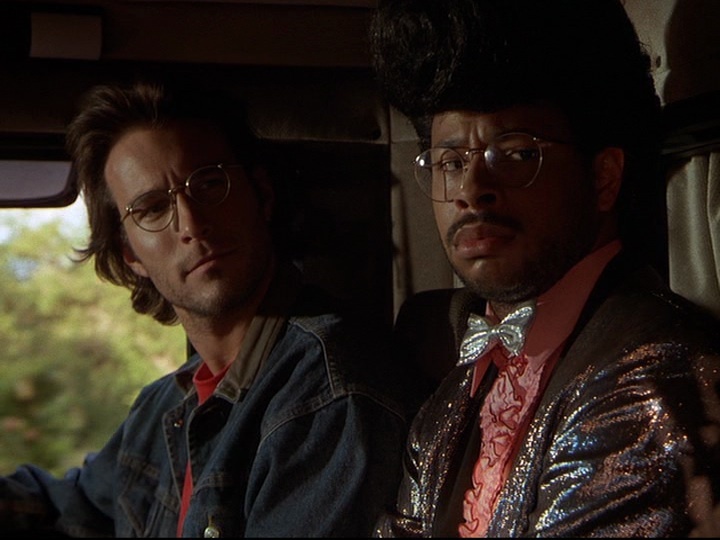 ← Darren Burrows’ Northern Exposure Book/DVD is Out!